Buy and sell used Articulating Boom Lifts from any and all manufacturers, including Airo, Genie, Haulotte, JLG and more. From 4WD Diesel Articulating Boom Lift: 40'-69' and 4WD Diesel Telescopic Boom Lift: 40'-69' to 4WD Dual Fuel Articulating Boom Lift: 40'-69' and Electric Articulating Boom Lift: 21'-30', you can be sure to find exactly what you need. 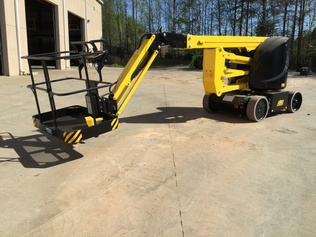 If you are looking for a used Articulating Boom Lifts, be sure to check out our upcoming equipment auctions.